The new helicopter will replace all the UH-205A "Huey" marking the end of an era. On June 24, the 5th “Rigel”, a Regiment of the Italian Army Aviation, received the first UH-90A helicopter. The aircraft landed at Casarsa della Delizia air base, north of Italy, after a flight from the 2nd "Orione" Regiment where is located the technical and logistic center for the aircraft. The next-generation multi-role helicopter will gradually replace all UH-205A "Huey" helicopters and will be included in the fleet of 27th “Mercurio” Squadron assigned to 5th “Rigel”. The UH-90A entered service in the Italian Army in 2008, it is a new generation aircraft produced by the NH Industries Consortium. It was developed following a common request from Italy, France, Germany, Holland and Belgium to better operate NATO missions. It is able to operate successfully in modern scenarios, where the high technological level of the systems is a fundamental and indispensable feature in order to meet ever more stringent technical and operational requirements. The Army-acquired TTH (Tactical Transport Helicopter) version has been conceived, developed and made to be able to carry out missions on all types of terrain, meeting all the specific requirements for tactical transport helicopters, ensuring a high coefficient availability in operations. - transport of a light tactical vehicle. 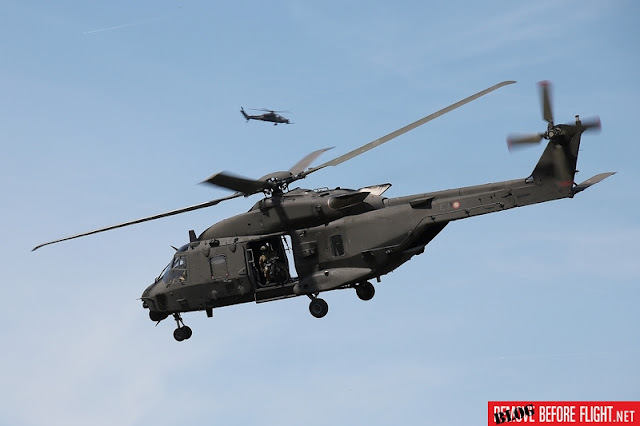 The event was attended by Brigadier General Paolo Riccò, Army Aviation Commander, Brigadier General Salvatore Annigliato, Brigata Aeromobile Friuli commnader, and Colonel Stefano Angioni, 5th "Rigel" Commander.